We have a special treat today with two unbelievably darling layouts from two of our talented design team members. 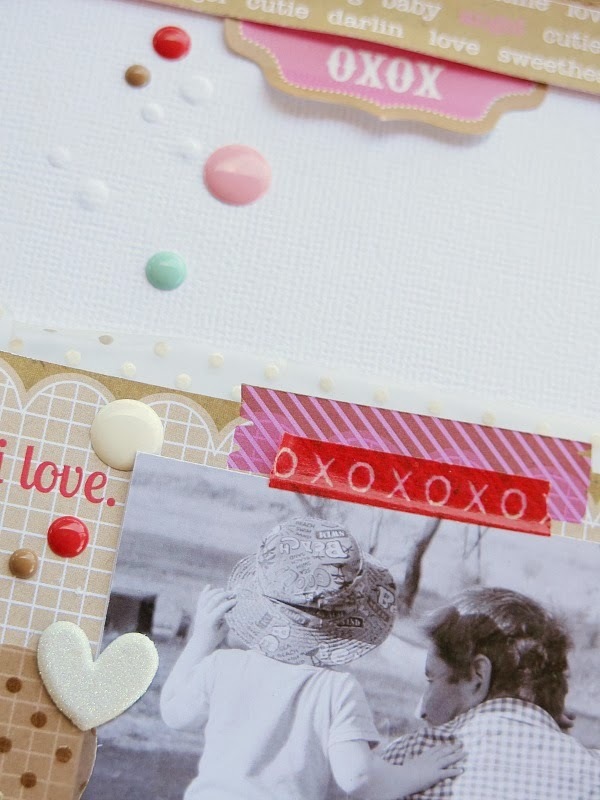 Both Kathy and Melinda loved working with the new Sweethearts Collection and you will fall in LOVE with their layouts. And bonus...we have a giveaway too, so be sure to scroll down to see how you can enter. 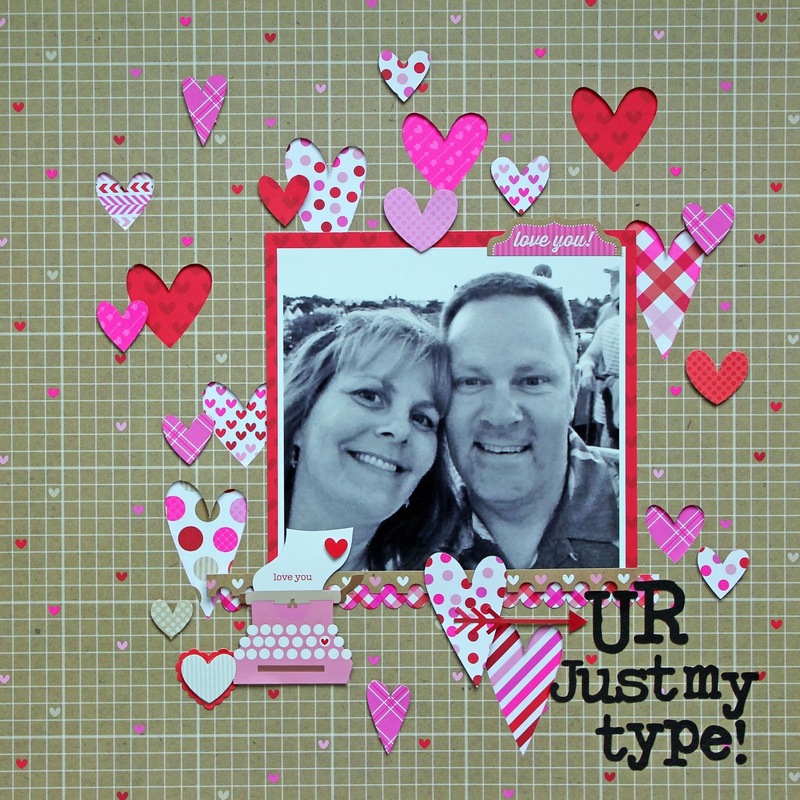 Hi Everyone, it's Kathy with a fun layout I created using the Sweetheart Collection. My husband is constantly saying that future generations will not know I existed by looking at my scrapbooks...so my resolution this year is to "be in the picture!!" This is a selfie my husband and I took last spring on a trip to Key West to celebrate our 20th Anniversary. I wanted to add some dimension to my layout so I die - cut some hearts from my background paper and backed the open spaces with various papers from the Sweetheart line. I used some foam tape to give the hearts more depth. I then added more hearts on the top layer and popped them up as well. I LOVE the little typewriter, it's so cute! It was actually the inspiration for my title. I added the little heart sticker with some foam tape for fun! That's all for today, thanks for stopping by to look! 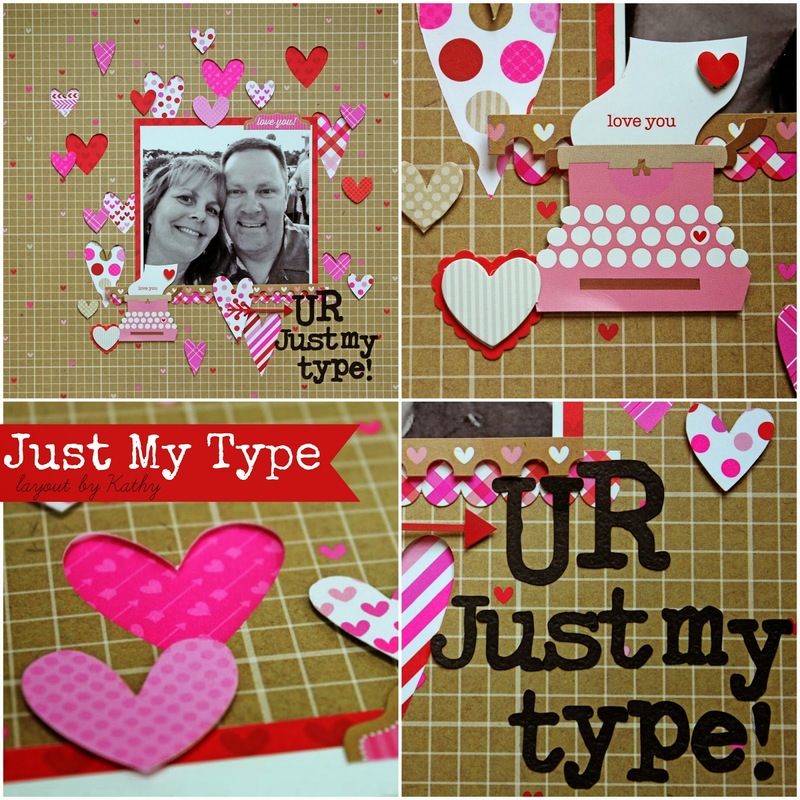 Hello, it's Melinda here to share a layout I've created using the gorgeous Sweetheart collection for a non Valentine's themed page! I've never really been one to side with convention when it comes to soft and 'pretty' colors on a boys layout, it just takes a bit of balance and the right style of photo. I chose to really focus on the Kraft papers and embellishments of the collection and only use a hint of pink scattered across the layout. AND can you spy the new Sprinkles Vellum??? If I ever had to choose a favourite product (at the moment) it would have to be epoxy dots... I just can't seem to get enough of them and love how they can be sprinkled across a layout to give a hint of color and whimsy. Loving the new washi tape designs in the thinner widths too! Now you don't need to wait until Valentine's Day to tell someone special you love them. 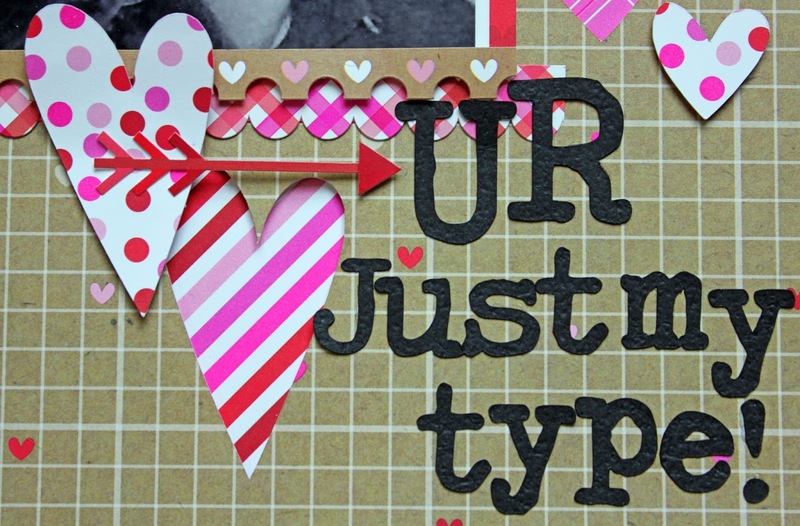 Why not make a non-Valentine's card and surprise your loved one on a random day... just because! Since we have double the inspiration on the blog today, we're going to give away double the prize... We are super excited to be giving away TWO BOXES full of the yummy new Sweethearts Collection. And we are going to give you multiple ways to WIN that prize. 3. Go to our FACEBOOK page and look for the collage images and leave a comment. 4. SHARE the image on FACEBOOK to your TIMELINE. Giveaway ends Saturday, February 1st at 8:00am MST. Winners will be posted on our blog Monday, 2/3. Thanks!! I have always loved hearts and "valentine-y" things so this collection is right up my alley. I love these! One is bright and bold and the other is soft and beautiful! I love Valentines Day and this collection so I'm in love! Great pages ladies! 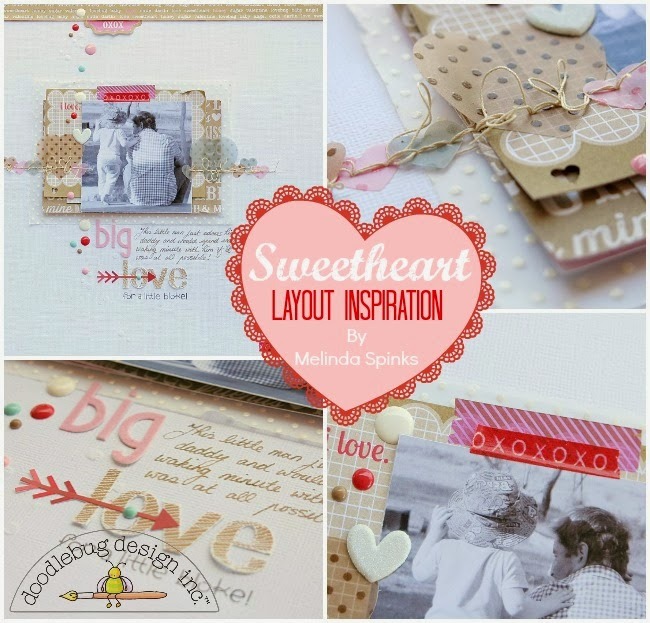 Love these layouts and the Sweetheart collection - thanks for a chance to win! Lovely pages, wish I was that creative! Beautiful pages! Thanks for the great inspiration and giveaway! This collection is amazing and super sweet, love it! Both of the layotus are sweet but I especially love Melinda's... Her attention to detail makes the layout extra special!!!! Thanks also for a chance to win! beautiful, the first one with the cut-out heart is my absolue fav!!!! Pinned the Big Love page! Love is definitely in the air .. what delightful designs and FUN photos!! what lovely layouts! love the fresh pretty colors! it puts me in the mood for spring! Gorgeous pages. Love the use of the negative hearts on the first layout. Beautiful collection. So cute!!! What a fun line and totally fab layouts! I would LOVE to win Anyyyyyyyything Doodlebug Designs.. Iloveyourstuff!!! Thanks for the chance to win.. and I commented, liked, shared, #tagged' and fb.. YAY!! I'm L.r. Smith on fb..
Gorgeous work ladies!!! Love the different looks! These products make me happy! I love Valentine's! These pages are making me so excited to take Valentines photos! Then I can scrap them with these cute products! I pinned that adorable layout with the typewriter! Great layouts! Love how the same collection produced totally different looks!! I commented on your Facebook page! I shared your giveaway post on Facebook! Both layouts are so pretty. Love the use of color and adore the epoxy dots too. Love the creativity and inspiration shared! Amazing Pages! great inspiration! Love Love your products!! Love these LOs! All the product is great.Super cute typewriter. Great ideas! I love this collection! I am so amazed and impressed with these layouts - both ladies used the sweethearts collection but the variety and versatility of Doodlebug products is just so amazing!! Love this so much!! So fun and loving layouts! These are so beautiful! Love the embellishment!! Liked, shared, pinned! Fingers crossed! LOVE this collection! Beautiful pages. Love the softness of the second one. So love the Sweetheart collection! Thanks for the chance to win! Such a fun and sweet collection! AWESOME layouts! I love them! I pinnedthe Big Love layout! I agree with Melinda, the epoxy dots completely make the project! These layouts are fabulous such a sweet line! Love the line and the inspiration. This collection is so darn cute! Adorable collection and layouts, I love the versatility of the bright pop of color on the kraft and white. I would love to win. I'm off to pin and like and share on Facebook. Beautiful layouts! 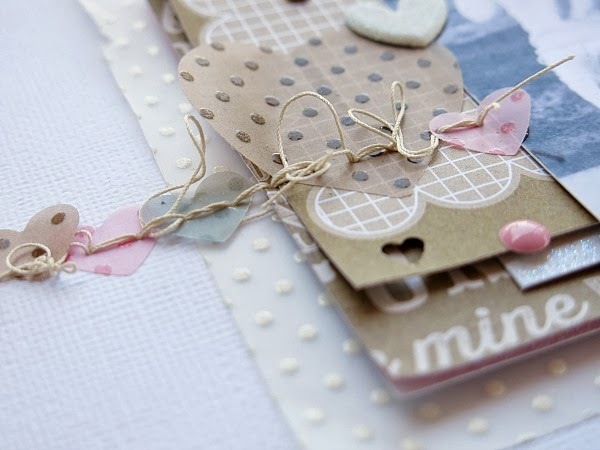 I love the colors, hearts and layering. Gorgeous layouts! I received a Sweethearts paper pad in the mail today and the papers are so pretty. Would love to win more. Love the layouts and this collection! Your new releases are wonderful! Left a FB comment as well! They are two of the sweetest layouts ever! I still cant get over that awesome typewriter! And the second layout is soo soft, its truly beautiful! Beautiful layouts! Love this collection! Beautiful layouts! Thank you so much for sharing, I too need to add myself to my scrapbooks! I love how the layout with the boys has allthat pink but doesn't look girlie at all. Hope I win. Fabulous collection equals fabulous layouts! LOVE LOVE LOVE!!!! Awesome Melinda! Holy COWS!!! I just gawked at Kathy's layout too, awesome job ladies! Love these layouts! So creative! Totally fabulous layouts and love the collection! 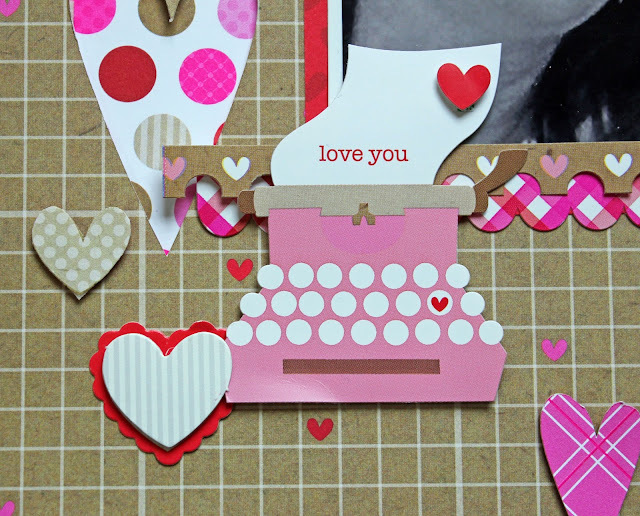 Beautiful layouts, the papers in the Sweethearts collection are just lovely. I LOVE these two layouts today and the collection they're made from. I am loving what I see! Great inspiration and cool new products. New washi widths...and vellum and more sprinkles. Yep...love! I really looked and looked I cant find the collage pictures. I must be blind. How far back should I go? Just gotta love the doodle bug!!! thanks for the awesome giveaway chance! Thanks for sharing the designs here. Keep up the good work. All the best. WOW these layouts are so pretty. shared & commented on FB. Real boys can handle pink, you see? BOTH layouts are DELIGHTFUL - filled with pretty details!!! LOVE the Sweethearts Collection and the Sprinkles Vellum and the Epoxy Dots ... and EVERYTHING!!! Oh wow I love not only your LOs but the pic of you and your hubby and your cute little story. It brought tears to my eyes and the warm fuzzy's to my heart because he's so right. Your scrapbook pages are so precious and beautiful. You are an extremely talented scrapper and scrapbooking is my passion. Thanks so much for the chance for an amazing prize. I love it all. Just started scrapbooking. Love these layouts. Wonderful layouts! Each one is different and gorgoeus! Left a comment on FB and shared! Those layouts are lovely. Beautiful products. I love the look of kraft against those bright colors- it makes them pop. I think you should do more kraft in your collections. Awwww...These are just wonderful pages of sharing your love with your loved ones...TFS! Love the sweethearts line! The combination of kraft & pinks is amazing! By far the cutest valentine collection I've seen!! This lovely layout reminds me that I need to make a layout with me and my husband. We have 3 kids and that is always the focus of what I do. It's time we had a turn! Love all the designs. February and hearts are my favorite - excited to try some of these ideas. Thank you for the cool ideas. All 4 options have been done. Pinned and am commenting here - these are gorgeous and what a wonderful new line. I especially love that heart banner on Melinda's layout with the loopy stitching which i will be giving a go really soon. The vellums are perfect. *sigh*! LOVE them all thanks for the opportunity to win such lovely items! I love both layouts for different reasons. The first one is fun and bright and the colors pop against the kraft, and gives a whimsical feel. I am a big fan of Melinda's wonderful works of art, and really really like the soft dreamy feel of this layout. Really love the intricate work with the jute, trying to figure out how she did it. Love, Love, Love the Expoxy Dots! Would sprinkle them everywhere if I won!!! Gorgeous layouts ... Big Love is just a beauty! I love this collection! I can not wait to scrap with it. Thanks for giving me some ides to work with today. I LOVE these gorgeous Layouts!!!!!!!!! They are so fabulous! It makes me want this WHOLE line! Left a comment on one of the images on Facebook. These are fabulous! I love the die cutting on the Kathy's layout (and the fact that her goal is to be in the picture more - it's my goal, too!) 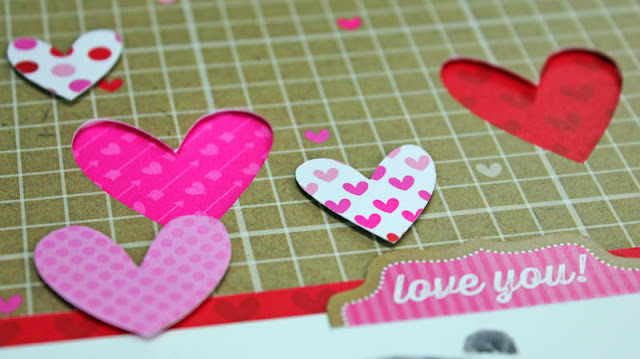 The vellum hearts on Melinda's layout make my heart skip a beat! Thanks so much for sharing and inspiring! These are both gorgeous! Love the different techniques used in both LO's! Wow that vellum is amazing, beautiful work ladies! Love these layouts! They are beautiful! Gorgeous layouts!!! I love Doodlebug products! Thanks for the chance!!! These are amazingly fun! Would love to play with such great stuff! Lovely layouts, this collection is just so pretty. The kraft with the pinks and red really pops. Gorgeous layouts! Thanks for sharing! Great layouts! Thanks for the chance to win. Would love to get some blog candy in the mail. Such wonderful papers in this collection..loved seeing the layouts. Gorgeous layouts! Thank you for the chance to win! Dear Doodlebug...this new Sweethearts collection is just amazing!! You always have the cutest valentine collections. All of your collections are just so bright and cheery...thank you for the chance to win such an awesome prize! !